Mirror Silver inks H5996 and Mirror Plus H6000 are solvent based screen printing inks for creating mirror-like surfaces or having the appearance of chromium. The mirror effect is created only when printed on the reverse side of the materials (second surface print) and when viewed through the top of the first surface of the substrate. Mirror Silver Plus H6000 provides the clearest mirror effect. I consent to the storage and use of the previously entered data. 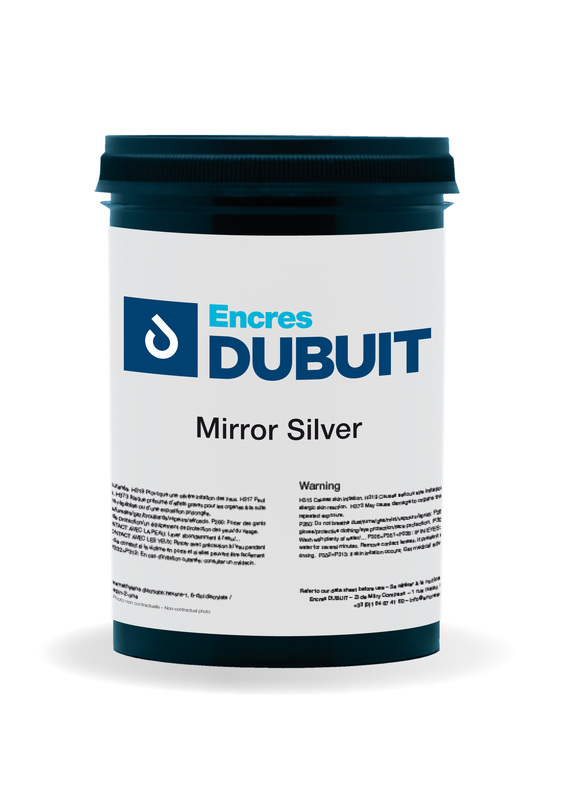 The data will be used exclusively by Encres DUBUIT Group to send technical information, commercial information, quality information and newsletters. The form above is intended to allow you to receive technical information, commercial, quality information as well as newsletters by email. The data concerning you are processed by Encres DUBUIT Group to create and manage your account, customize your services and manage your orders (including for fraud prevention), measure your satisfaction and for marketing purposes (customer knowledge, targeting advertising, etc.). Fields marked with an asterisk are required.